Mainz - 1. 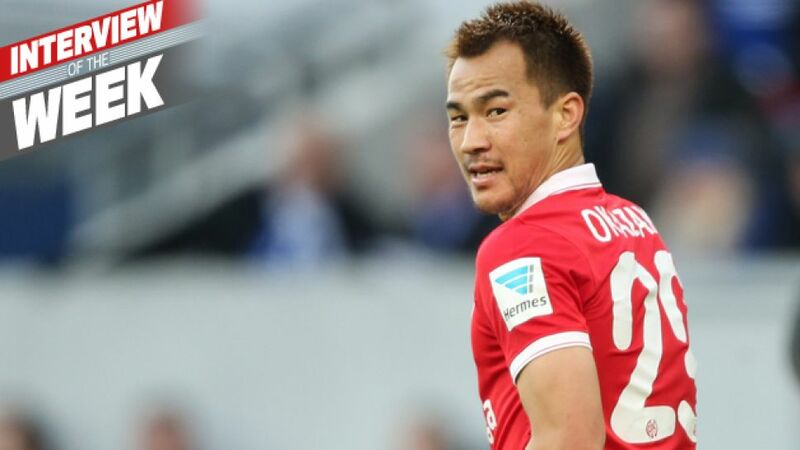 FSV Mainz 05's fortunes are almost inextricably linked to those of their star striker Shinji Okazaki. When the 88-time Japanese international is fit and firing, usually so are his team. However, with the Karnevalverein only two points clear of the relegation zone and hosting high-flying Borussia Mönchengladbach on Matchday 24, they need the 28-year-old marksman more than ever. bundesliga.com: Shinji Okazaki, sections of the media are praising Mainz for returning to their strengths under new coach Martin Schmidt. In what way has the team’s style of play changed since the switch of coaches? Shinji Okazaki: Our strategy is pretty simple. After winning the ball, we want to get behind the opposition defence as quickly as possible. Under Kasper Hjulmand we had more possession, but we've reverted to our old strengths with our current style. We have more chances to score and take fewer risks. Okazaki: He certainly is. He’s a real fighter and is full of emotion. Okazaki: I’m really pleased about that. I’m of the opinion that players who perform well in training should be out on the pitch playing the games. If you sense trust, you take on a bit more responsibility and for me that means scoring goals. bundesliga.com: Before the winter break, you scored eight times, but you haven’t yet found the net in the Rückrunde. What do you put that down to? Okazaki: In the Hinrunde I had a good period when I scored regularly. But even then it was noticeable that we were creating too few chances - and in most games I only had one or two good opportunities. For that reason, and because it was obvious that the opposition would adapt better to my style of play, it was predictable that I wouldn’t be scoring all the time. On top of that, I’ve obviously played in the FIFA World Cup and the [over the last year] as well. But I still want to score goals and I’m very motivated to take myself to a higher level. bundesliga.com: In which areas would you like to improve? Okazaki: I want to score and assist goals. Against opposition who pick up my movement and defend tight, I want to find new ways of scoring. I’m also helping my team-mates more. I already have four assists this season, and last season I only got one overall. Back then, I measured myself solely in my number of goals, but now I want to help the team in other ways, which is working better and better. Having said that, scoring remains the most important thing for me - I haven’t forgotten that I’m a goalscorer. bundesliga.com: What made you decide to vary your style of play? Okazaki: You can’t always stick to a certain style. You have to adapt to your team-mates as well as to the opponent. I’m much more varied now and I want to score lots of different types of goals. This season, for example, I’ve converted more crosses, whereas last year I tried to get behind the opposition defence more often. bundesliga.com:Lots of Japanese players move to the Bundesliga. What does a Japanese player need in order to be successful here? Okazaki: If you want to succeed in Europe, you have to be patient and you can’t give up. That’s not always easy. But even in difficult times, you shouldn’t immediately start thinking about going home, even if the J-League can be just as good a springboard to make it into the national team. Okazaki: That’s true, but I really think you should try everything in order to succeed here and give it your all in training. Sometimes, a conversation with your coach can help. Willpower is crucial. If you don’t have strong enough willpower, you’ll fail. You have to face the challenge with confidence and not run away from it. Okazaki: That’s right, but it’s not a problem. When I’m in Japan I like making people laugh, but here I can just as easily listen and laugh along. Even at home, for example, I’m more of a listener. bundesliga.com: Is it true there’s a special bond between you and the South Koreans in the Mainz team? Okazaki: Absolutely; we spend a lot of time together. At the moment, I’m going to Joo-Ho [Park]’s for dinner quite a lot. His mum cooks for us. I’d really miss Ja-Cheol [Koo] and Joo-Ho if someday we didn’t play together any more. Okazaki: Gladbach have a lot of quality at the back and going forward. They’re very well organised, so we’re going to have to try to be very mobile and disrupt their organisation. We will have to play aggressively, that’s the most important thing. I’m confident that we can beat them.